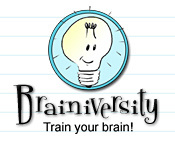 Brainiversity is rated 3.1 out of 5 by 11. 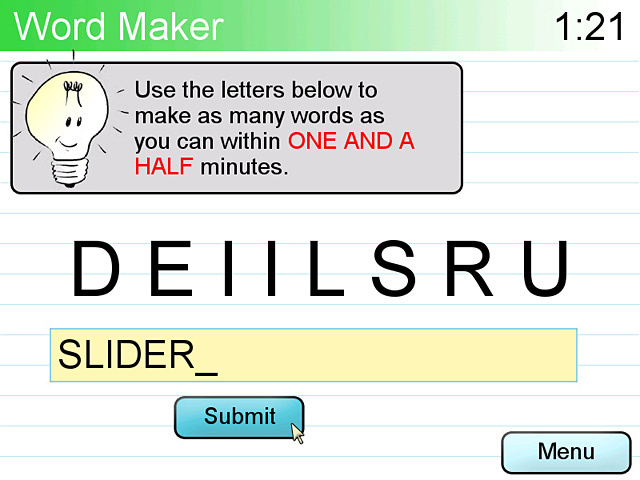 Rated 4 out of 5 by mrm2006 from How Is Your Brain Power Today? Graphics: Very well done. Especially when you had distinguish rows from columns and one color from another. Sound: Sorry, tuned it out. Game Play: This is an interesting game in that there are 4 different levels you can choose to "practice", such as Math, Memorize, Analysis and Sort. You can also do a Daily Challenge whereby random tests are given. They are by no means easy. There is an electric light bulb as your "tutor" throughout the game, however he does speak as much as just makes noises. This Glam-ma would definitely rate this for the more experts in the gaming world. I enjoyed the game but uninstalled it after 25 minutes because there were only 4 "tests" to take and they became so repetitious they bored me. Glam-ma still thinks you should try the demo - it's free - it's only an hour. YOU may have the brain power to beat Brainiversity. The review of this game is based on this Glam-ma's opinion - and only mine. Therefore, if you found this review to be helpful, please click on the "yes" button below. There is also a "no" button. Seriously? You'd give your Glam-ma a "no"? Kidding. Happy Gaming! Rated 4 out of 5 by laurakay76 from Brain training If you've ever played Brain Age on one of the handheld systems, then you have some idea of what to expect from Brainiversity. With the help of the world's cutest light bulb, you can increase your mental acuity through different exercises in memory, math, language, and analysis. Test yourself daily to see how well you're progressing. Earn stamps by achieving particular goals, and unlock different kinds of exercises by remaining consistent with your training. My only complaint is that it's not completely touchpad-friendly; more than once I accidentally clicked on a wrong answer while in the process of moving my arrow to the correct one, and I was docked points for the misclick. But the exercises are well crafted, the graphics are cute, and while I found the light bulb's "voice" to be annoying, it can be turned off without any difficulty. If you like the concept of a Brain Age style game that you can play on your computer, this is a good game for you. Rated 4 out of 5 by smilesmiley from WOW!!!! This game is not for the light-hearted. This is for anyone who is trying to make sure they don't loose their mind to old age. This is way better than those games they sell to kids on the game consoles. DEFINITELY challenging!!! Rated 4 out of 5 by kittyfish51 from Challenging I played the hour trial. 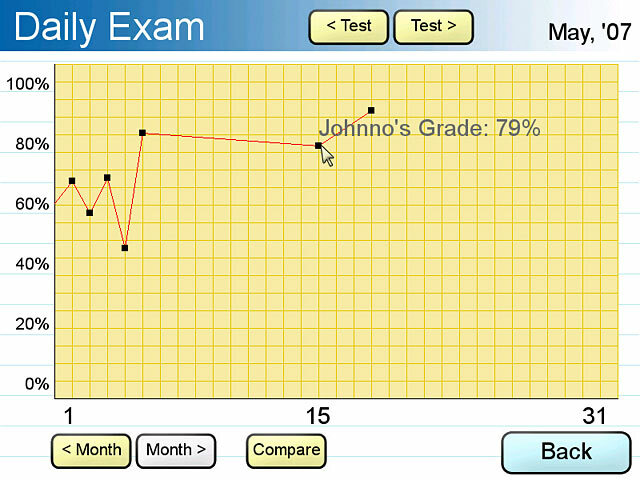 I spread it over a few days so I took the daily exams and the game plotted my improvement (or in some areas demise). 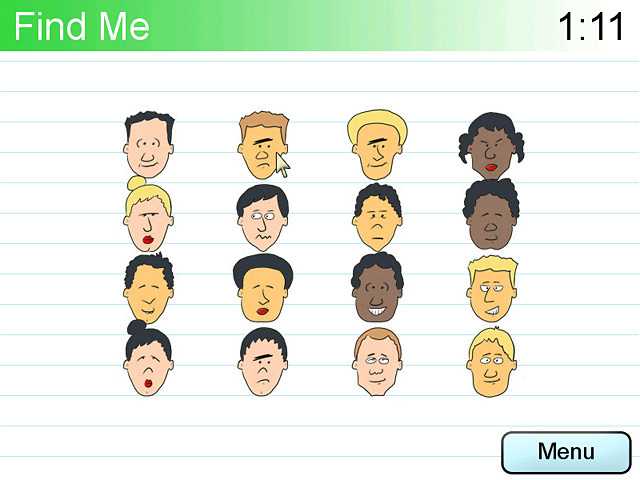 One of the tests is name and face recognition which gets progressively harder. This is a different skill set than the regular word and math tests. As with the other tests they were not always what you would expect. You are timed in each test. There were other tests in each category that you unlock as you play more of the game. The graphics were not exceptional but for this they really do not need to be as it probably would distract you from the task at hand. The really annoying and distracting thing was the "voice" of the light bulb guide in the game. It sounded like a fly or bee buzzing. If I purchased the game I would need to mute that sound. If you want to build your brain with different challenges then I would definitely recommend this game. Rated 4 out of 5 by purpleporpoise from Great Brain Challenger! This is a great game to exercise your brain. A friendly light bulb (light bulb for bright idea?) guides you through timed tests in 4 categories - language, memorization, math and analytical - that get progressively more challenging as you improve your score. You can only take the daily exam once each day, but you can take unlimited practice exams. Also, different levels in each of the 4 subjects tests are unlocked as your score improves, adding more variety to the gameplay. The graphics are just so-so, but sufficient for the purpose. It's a game for testing your brain, so don't expect to be entertained, except by light bulb's encouraging and, at times, funny comments. He's really quite clever and interacts with the player. For instance, when I logged on the game just now (it's after 1:00 a.m. here), he asked me "Shouldn't you be in bed?" Now, how cute is that? The only complaint I have is that, as cute as the little light bulb is, his voice is kind of irritating. But his comments are also captioned, so I just turn the sound down. Whoever programmed the game did a great job. I would have given it fives in all categories except for the mediocre graphics and sound. But I'm not really sure that more should be expected, since this isn't really that type of a game. I haven't unlocked all the levels yet, but my scores are getting better. It's already improving my memory and recall somewhat. If it actually makes me smarter in the long run, you can bet I'll be singing Brainiversity's praises for a long time. I did buy the game after the trial and I'm really delighted to see that there is a Brainiversity 2. If you like word and memorization games or are wanting to improve your memory and sharpen your thought processes and aren't concerned whether it has mind-bending graphics or animation, you'll probably enjoy this game. Rated 3 out of 5 by cazmo from Doesn't work properly! Game seems ok - "The Daily Exam" bit works, but the "Practice" part doesn't!!! Rated 3 out of 5 by catbag8717 from Fun For The Trial I didn't mind this game. It was a good challenge. Good Parts: Gameplay was good. Simillar to other Brain Games I've played such as Big Brain Academy. Daily Exam was fun and practice was a good way to tune my sklls. The minigames were a great challenge and really tested al 4 corners of my brain. Stamps were included. This made the game fun as I wanted to collect them all. The game was fun to play. OK Parts: Game did get a little boring at times. Should've been more games unlocked at the start. Bad Parts: Graphics are poor. They really need some re-working. This game is one of those games I'd be happy to play for the free trial and leave it at that. It's great fun and shall provide entertainment for everyone. Rated 2 out of 5 by eupawel from save Your money i dont recomend this poor game: poor music, poor graphic, not chellenging. i recomend: Brain Training for Dummies, The Amazing Brain Train.